I stayed up til 12:30am last night doing blog anf email things. This is just my third zero and many things had built up over the past 780mi. I thought I might sleep in today, but nope, I was wide awake at my regular 6am. I stayed at Shanti’s until 1pm and the time just flew by! Here is my breakfast. 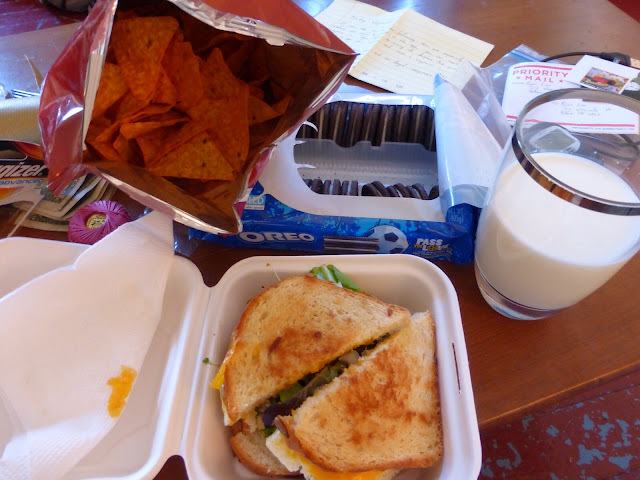 I was eating the Oreos and Doritos Shanti got me and then she went out and brought me back a proper organic egg sandwich that was great! Shanti was the perfect host, having done the AT in 2012, and I was quite spoiled. THANK YOU Shanti for being your awesome self! I know that one day I’ll be hosting you when you do the PCT! Kicking myself for not getting another picture with you today. I also got a gift in the mail from my PCT and CDT friends LoveNote, Burly, and Drop-N-Roll (who I Skyped with a couple weeks ago). They sent me a ROCK! 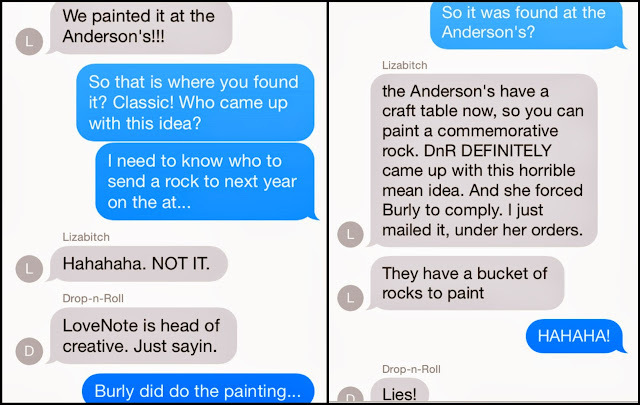 Yes, a rock…not just any rock though. 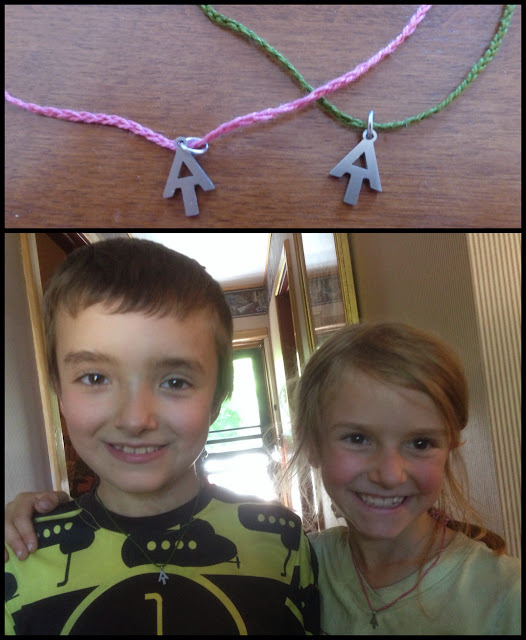 They were together a couple weekends ago helping out at a popular trail angel’s house on the PCT, the Andersons. 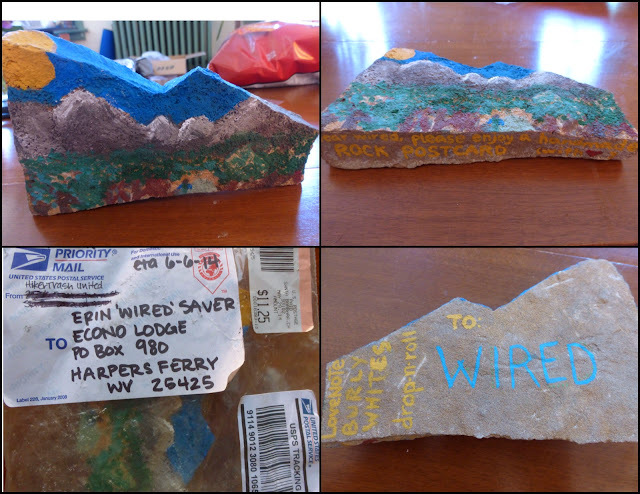 While there, they painted this rock postcard for me and go the genius idea to send it to me. It was sent in a Ziploc (one of our inside CDT jokes is “put it in a Ziploc!”) and somehow made it. Notice that it was sent from Hikertrash United. distinguish her from other Liz’s in my phone. All of you who followed my PCT and CDT blogs will really appreciate this conversation. Also, this morning I made Cartwheel her birthday gift since her birthday is tomorrow. I got her and Robin Hood AT pendants while I was at the ATC yesterday and got string to braid them each their own colored necklace. I got to see the Kallins after I left Shanti’s and we hung out for an hour or so. I should see them tomorrow, but just in case, I gave Robin Hood and Cartwheel their gifts today. Love it! We all walked over to the ATC Headquarters again together. It’s just fun to go over there and take it all in again. We looked in the book and here is their photo they took yesterday. 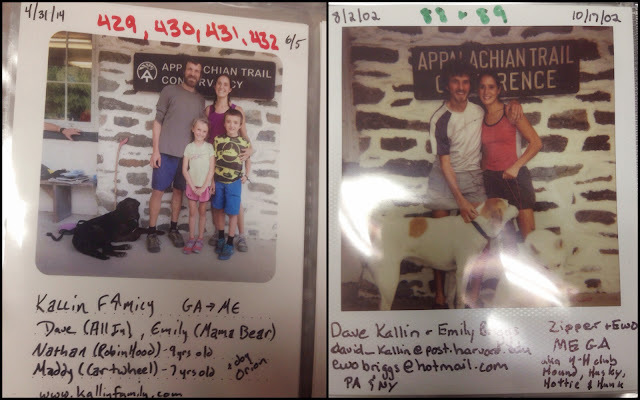 The ATC keeps archives of all the previous years and we looked in the 2002 book to see All In and Momma Bear’s photo from when they first thru hiked the AT southbound with two dogs. Check out All In’s hair! The Kallin’s ATC photo this year and All In and Momma Bear on their 2002 sobo hike. 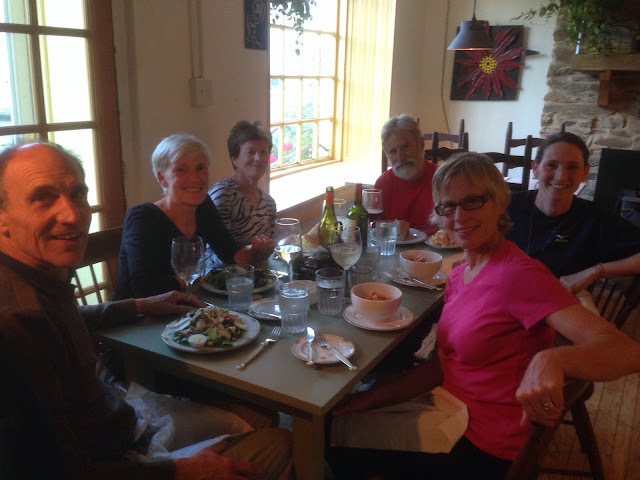 I checked into a bed and breakfast in downtown Harpers Ferry and my step mom and family friends arrived. Robin is my step mom and has been my resupply point person for all three of my hikes. It is not a fun task and I don’t know what I’d do if she wasn’t there to organize all of it! She flew into DC from Southern Illinois and was picked up by Gary and Anne who have known my dad since before high school! Two of their friends, Margaret and Mike, also drove down from DC to have dinner with us. It was great! Tomorrow I will spend time with Robin, Gary, and Anne as we will do some local sightseeing in town and then they will hike north 10mi with me. The Kallins hiked those 10mi this morning and will be spending the morning in town for Cartwheel’s birthday. The plan is that they will get back to the trail by driving Gary and Anne’s car to the 10mi mark so that they can drive back to DC with Robin tomorrow night after day hiking with me. Then the Kallins and I will head north…possibly together…just not ready to say goodbye to them yet!